The 2016 Manulife LPGA Classic golf tournament for women players on the LPGA Tour is taking place this week from September 1-4, 2016, at the Whistle Bear Golf Club located in the Toronto suburb of Cambridge, Ontario, Canada. Here is a list of the prize money up for grabs at the 2016 Manulife LPGA Classic. The Manulife LPGA Classic dates back to 2012. 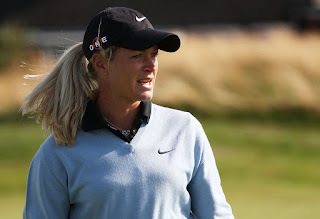 The four winners of this LPGA tournament are Brittany Lang (2012), Hee-Young Park (2013), Inbee Park (2014) and Suzann Pettersen (2015 pictured above). Total prize money up for grabs at the 2016 Manulife LPGA Classic is $1.6 million. That is up 6.7% over the $1.5 million in prize money that was up for grabs in this tournament last year. The winner of the 2016 Manulife LPGA Classic will earn or win a paycheck of $240,000. That is up 6.7% over the $225,00 that Suzann Pettersen earned when she won this women's golf tournament last year. Second place is worth $149,000 at the 2016 Manulife LPGA Classic. That is up 6.7% over the $139,472 that Brittany Lang earned when she finished in alone in second place in this tournament last year. Third place at the 2016 Manulife LPGA Classic is worth $108,000. That is up 6.7% over the $101,250 that Mariajo Uribe earned when she finished alone in 3rd place at this tournament last year. Fourth place is worth $84,000 at the 2016 Manulife LPGA Classic.